At one point in his Catholicism series, Fr. Robert Barron reflects on Israel’s hopes for the coming messiah. He lists out the expectations of what the messiah would accomplish and he demonstrates how Jesus fulfills all of these expectations yet in often unexpected ways. One such example is the expectation that the messiah would restore the unity of Israel. Fr. Barron points out that Jesus does in fact accomplish this but not through leading an army nor through political maneuvering. Jesus accomplishes the expectation of restoring unity through his miracles of healing. In their physical impairments; the blind, the lame, the mute and the leper were not only handicapped in body but were also cut off from the ritual life of Israel and therefore could not fully participate in their society. By his acts of healing not only was Jesus curing the physical ailment of the person but he was also restoring him or her to full participation in the community. This Sunday’s gospel story of the blind beggar Bartimaeus (Mk. 10:46-52) is a case in point. But, not only that, it must be noted that Jesus recognizes the separation and isolation present that was easily overlooked by the very people who were longing for the messiah. Mark tells us that when Jesus left Jericho he was with a sizable crowd and that as this crowd surrounding Jesus draws near and begins to pass the blind beggar Bartimaeus (in his poverty it must be noted) weakly begins to call out: Jesus, Son of David, have pity on me. Mark specifically then states: And many rebuked him, telling him to be silent. The very ones who were yearning for the full restoration of Israel remained blind to this man’s (their fellow Israelite) separation and isolation. But, Jesus saw Bartimaeus and he heard his cry. In this we are brought to the realization that not just the work of restoring unity but also the ability to first see isolation and separation is an aspect that also marks the long awaited messiah as anticipated in the writings of the prophet Jeremiah. Part of which we hear in today’s first reading (Jeremiah 31: 7-9): Behold, I will bring them back from the land of the north; I will gather them from the ends of the world, with the blind and the lame in their midst, the mothers and those with child; they shall return as an immense throng. Through Christ, we have been made a priestly people and we now share in the High Priesthood of Christ (Hebrews 5:1-6). As a nation of priests we are entrusted with the work of restoring unity to a divided and hurting world and the first step in this work (upon which the whole is based) is the ability to see and recognize separation and isolation. Separation and isolation within our own world and within our own hearts. For this, it is essential that we have the trust and faith of the blind beggar. Like Bartimaeus, we too need to trust that our God is a loving and merciful God who hears the cry of his people. Jesus, Son of David, have pity on me. This must be our prayer and we must let this prayer lead us to the separated and isolated places of our world and the separated and isolated places in our own hearts because it is there that we will encounter Christ and we will truly come to know him as messiah. After hearing his request, Jesus says to Bartimaeus: Go your way; your faith has saved you. Mark then writes, Immediately he (Bartimaeus) received his sight and followed him (Jesus) on the way. 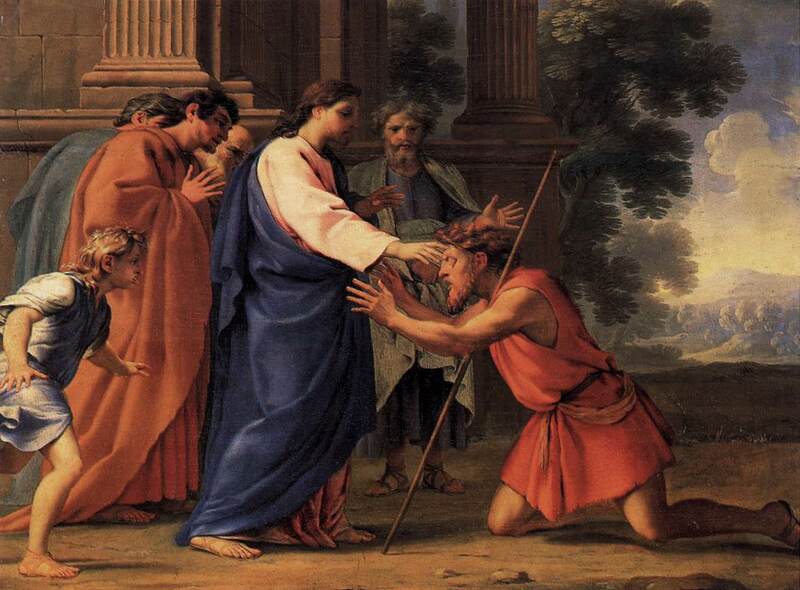 Through this encounter in a place of isolation and separation, Bartimaeus came not just to be healed physically of his blindness but also to be healed spiritually as he came to recognize Jesus as both Messiah and Lord. Today’s gospel calls us also to a healing just as it did that first crowd. May our blindnesses also be healed and may we learn to see as our Lord sees in order that our work of restoring unity might be true.